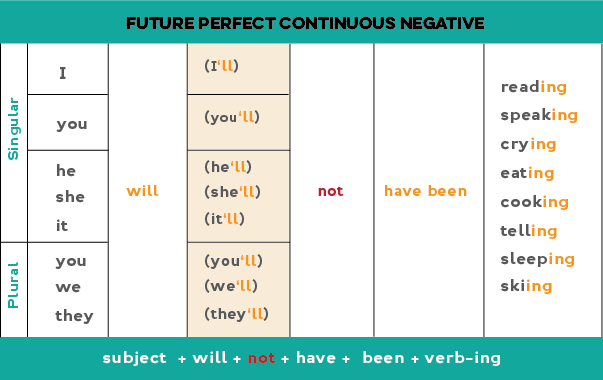 Let's learn how to form the future perfect continuous tense. This tense is formed using the auxiliary verb "have" plus the past participle of the verb "be" (been) plus the -ing form of the main verb. 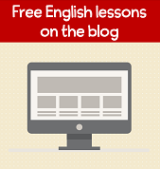 We'll learn how to make positive and negative forms, short forms (contractions) and questions. 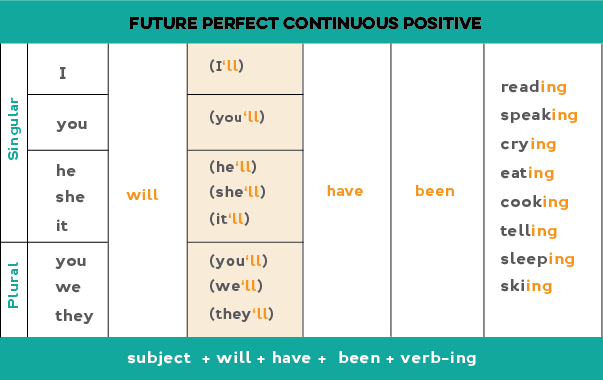 To form the present perfect continuous: we use "will" + "have" + "been" + the -ing form of the main verb. I will have been feeling nauseous for a week as of Thursday. On Thursday, he will have been living in Peru for a year. If my boyfriend and I are still together in June, we'll have been dating for five years. I don't think it's coming. Soon we'll have been waiting an hour for the bus. Next week I will have been working here for 20 years! In a little while I will have been listening to them say the same thing for almost an hour. subject + will + have + not + been + -ing form of the main verb. 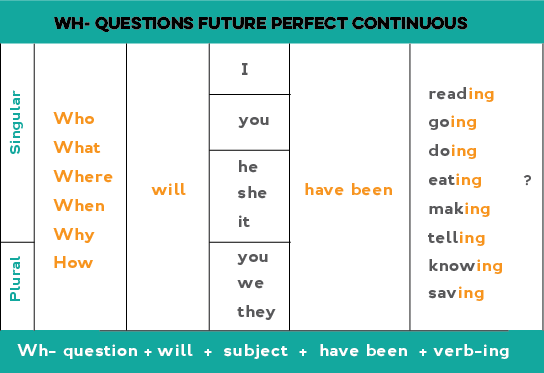 We can also use the contractions either using "won't" (will not = won't) or the contractions listed above in the chart. This summer they'll not have been living here for even a year. They will not have been cooking for very long. I'll not have been running long enough to try a marathon this year. I will not have be smoking for a year at the end of September. She will not have been working a year before she goes on maternity leave. You won't have been working here long enough to collect unemployment. Will + subject + have + been + -ing form of main verb ? Will you have been working at the company long before you quit? Will the kids have been eating better by the their next doctor's appointment? Will they have been waiting a long time for us? Will her coach have been training with her long enough to see any results? Will I have been exercising enough to lose weight by my wedding? Notice the word order. 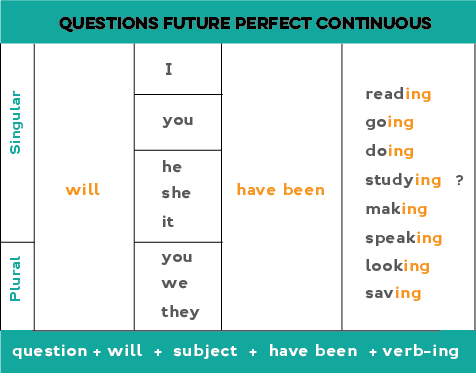 The wh- question word comes before "will" and then the subject and the past participle of "be" (been) and then -ing of main verb. How long will you have been living here at the end of the year? Where will your mother have been staying before she moves in August? What will the professor have been teaching by the mid-term? Who will they have been training before the conference? What support will the government have been providing for small businesses? How much money will we have been saving by next year if we switch plans? Check back for exercises that will help you practice the future perfect continuous. 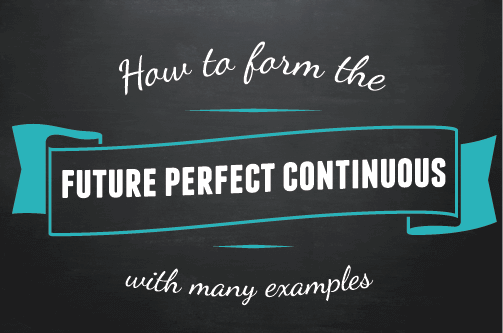 Click here to learn when to USE the future perfect continuous.